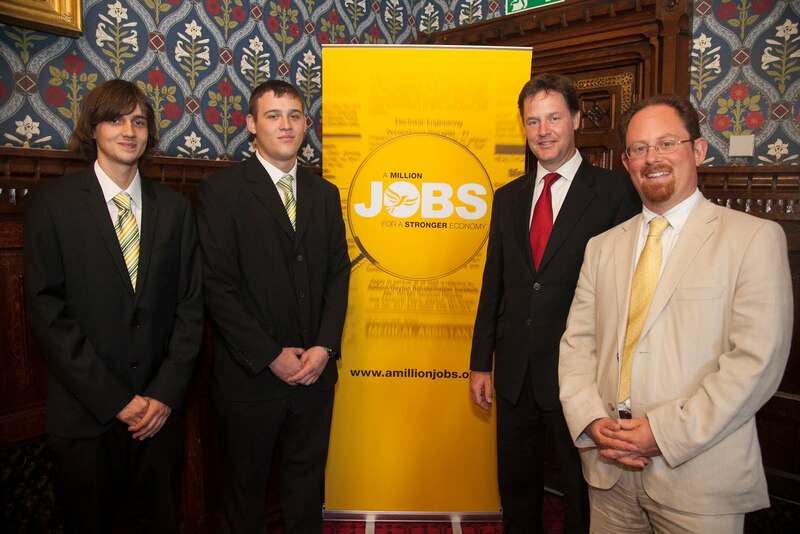 Cambridge apprentices, Harry Zwierzanski and Darren Frost were invited to meet Deputy Prime Minister, Nick Clegg at a reception to celebrate their success. 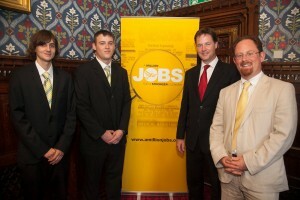 Harry and Darren, both 21, were guests of Cambridge MP, Julian Huppert at the event at the House of Commons for apprentices and their employers. The pair, who work for building company, Barratt Homes on its site in Trumpington Meadows, Cambridge were given the chance to quiz Mr Clegg, Leader of the Liberal Democrats before having their photograph taken with him. They were joined at the reception by their employer David Eardley, Managing Director for Barratt Eastern Counties. Julian said: “I am delighted that we were able to celebrate Harry and Darren’s success on the apprenticeship programme. The scheme has encouraged 1,060 people to take up an apprenticeship in our city in the last two years. Harry, from Cambridge is in his first year of the Barratt Homes’ carpentry apprenticeship after working as a chef for two years. Darren, from Newmarket said: “I have always enjoyed working with local tradesmen at weekends and during the holidays and have had some experience with carpentry and as an electrician. David Eardley, said: “Trumpington Meadows is an ideal development for Harry and Darren to start their construction careers, offering them great experience in building sustainable homes. 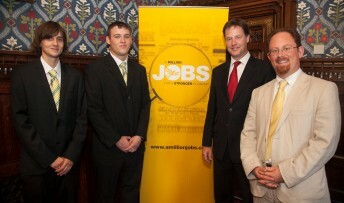 Nick Clegg said meeting Harry and Darren and seeing how much they have achieved through apprenticeships was inspirational. “I want to see apprenticeships viewed as a much more mainstream route to work,” he said.